All across America big cities and small towns are experiencing recovery, revitalization, rejuvenation. People are drawn to the unique things each has to offer; theater, dining, craft beer and cocktails, music, recreation. Tonight we are in Livingston County, about an hour northwest of Detroit in the city of Howell. At 4.95 sq. miles this historic town has a picturesque downtown with a lively dining scene. 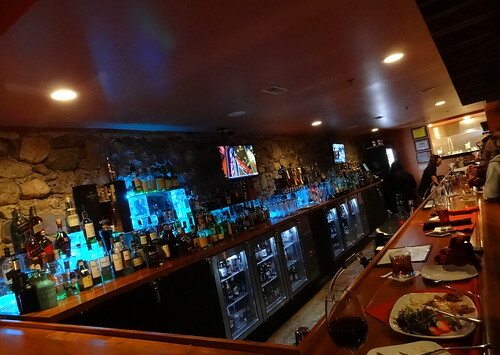 We have the evening all planned out starting with dinner at The Silver Pig. 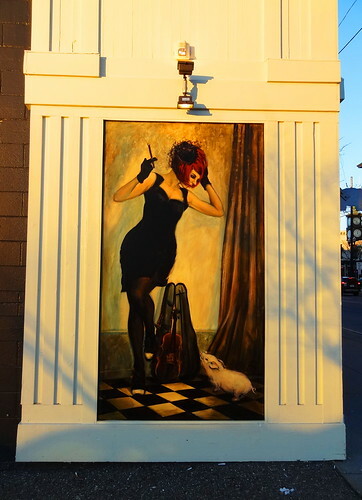 We’re parked behind the restaurant, a swanky mural of a cabaret performer covers a corner of the wall, the piglet at her feet assures us we’re at the right place. 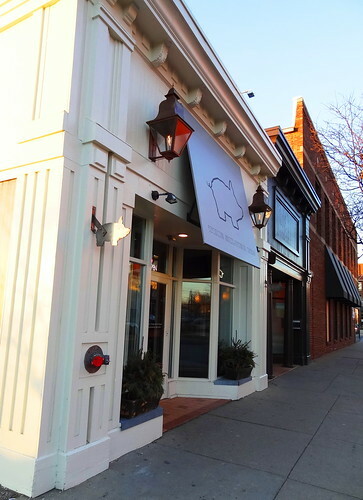 The entrance is marked with a silver awning, a pig juts out at the corner. 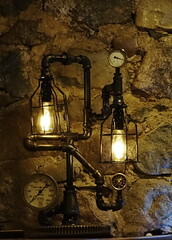 Inside the decor is dark, quaint, definitely urban, I like it. The menu and list of specials is concise, making ordering easy, the cocktail list is impressive. With a little help from our server our order is placed and cocktails served, while I sip on Strawberry Fields, enjoying the muddled strawberry, lavender and honey, Kris is relishing one of the best Old Fashioneds he’s ever had. 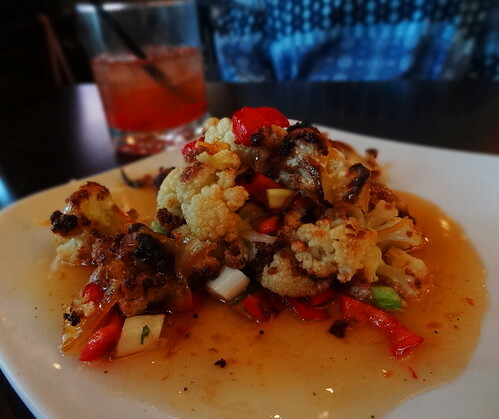 We snack on the house Truffle popcorn until the Sweet and Sour Cauliflower arrives, absolutely delicious in a spiced orange marmalade glaze with red jalapeno. 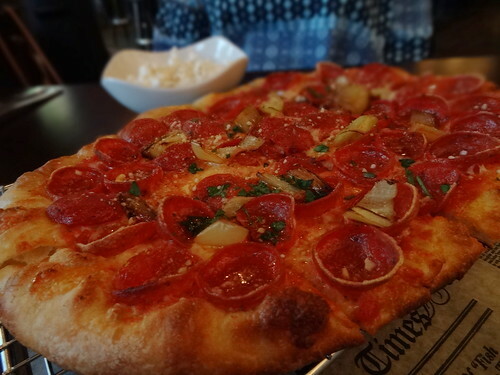 The pepperoni pizza is served on a cooling rack straight from the brick oven, it’s crisp and extra flavorful with Hungarian peppers. All around us small plates and shellfish towers are being served, everything looks great; we’re definitely coming back. We exit through in interior door, cross a hall and cut through the sister restaurant Diamonds Steak and Seafood, looks pretty fancy, I’m adding it to our list of things to do next time we’re in Howell. We pass through the front door out onto Grand River, it’s a lovely evening for a stroll, the Howell Opera House is about a block down and our destination. Built in 1881 the Victorian 3-story structure was once the center of entertainment for the surrounding communities. In those days live shows like Hamlet and Mikado were performed on stage, the theatre hosted speeches–Henry Ford once spoke here, dinners and graduations. 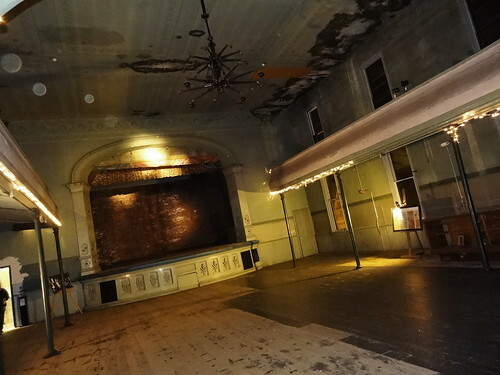 In 1924 the 800-seat theatre was closed by the Fire Marshall. 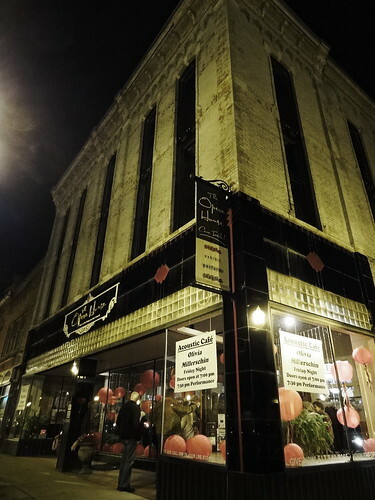 While the first floor was used as retail space the second-floor auditorium was used as storage space for the local hardware store; it sat dark for more than 80 years. 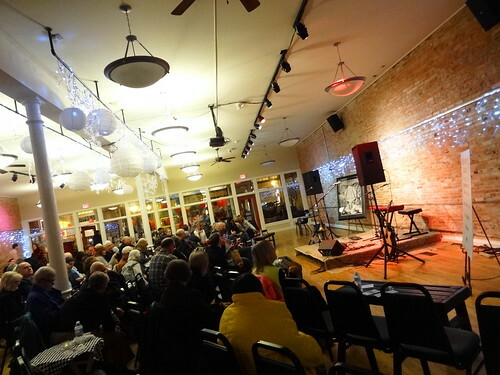 The Livingston Arts Council purchased the building in 2000, in 2007 after a complete renovation of the first floor the building was reopened and is now used for public activities such as tonight’s Acoustic Cafe. Olivia Millerschin is performing at 7:30, the lobby is packed with people to see the show. The open space is set up with rows of chairs theatre-style, small tables are inserted into the rows here and there for the comfort of patrons needing a place to rest a beverage or snack purchased in the lobby. Large round tables at the back of the room are already filled with people. Icicle lights are draped around the room, a small stage is set up in front, microphones, amps and instruments are all in place. At just 21 years old Olivia is already a music veteran, a singer, songwriter and musician, she’s been performing her music for years, you may have seen her on America’s Got Talent. Tonight is the CD release of her second full-length album Look Both Ways. Olivia’s been very busy, she played 200 shows across the country in 2016. 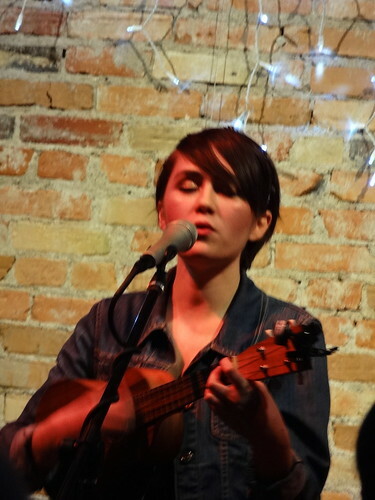 Tonight we have the pleasure of hearing her music live in an intimate setting. Her show is a mix of old and new original songs, she does a cover here and there of a variety of genres from Blue Skies to Tom Jones’ She’s a Lady; her rendition of Over The Rainbow is magic. In addition to being an amazing performer she has a great rapport with the audience, you can’t help but like her. 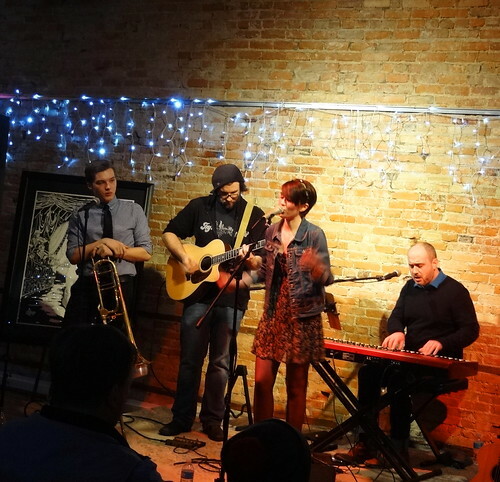 Check out her video on YouTube for “When” recorded right here at the Howell Opera House. After the show a small group of us are led upstairs for an informal tour of the actual theatre. Remember, this place was built before electricity, one day they closed the doors and that was that, today it sits pretty much the way it did back then. It looks and feels old, even the air smells old (not in a bad way), it’s like time just stopped in this room. The proscenium, a simple plaster arch, the original curtains are still in place, except for some water damage the painted ceiling is still in tact; the overall decor is true Victorian. Get a look at that unusual chandelier, we’re told it’s the original, it was gas-lit and then re-worked once electricity arrived. There is no lighting system, sound system, no plush seats. The floor creeks under our weight, ordinary poles support the balconies, old screen doors left behind by Sutton’s Hardware stand in a corner. Antique showcases house original playbills and other memorabilia. 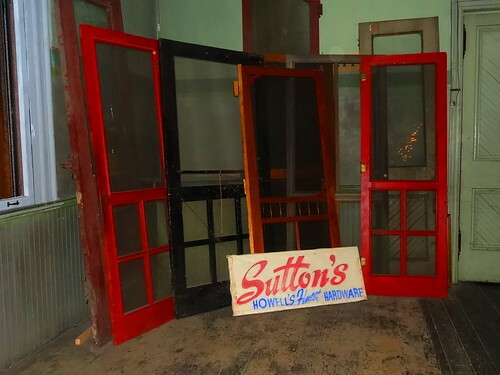 Doors at the back of the auditorium lead to the original lobby; patrons would enter from street level then take the stairs to the second floor theatre. 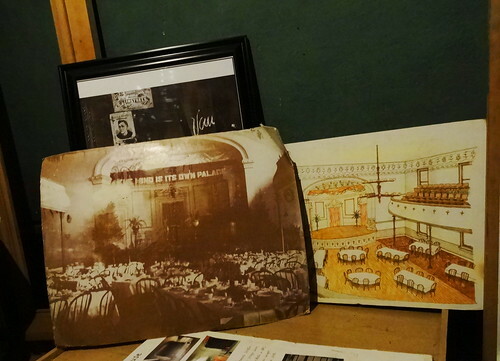 Here we see more photos of what the room looked like back in the day, it was quite lovely. Our guide tells us the theatre is haunted, they say 6 different ghosts inhabit the space… there was nothing unusual during our visit. They say it will take about $6 million to restore, funding it is a constant challenge, it will be a beauty when it’s done. 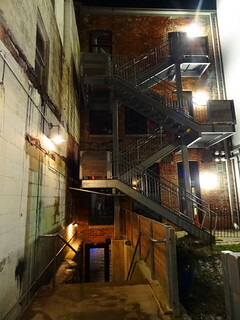 Across the street is a sign for Fog’s Pub with an arrow pointing to the alley; we walk around the block, go down a short stairway and find ourselves in the basement of the Heart of Howell Building. 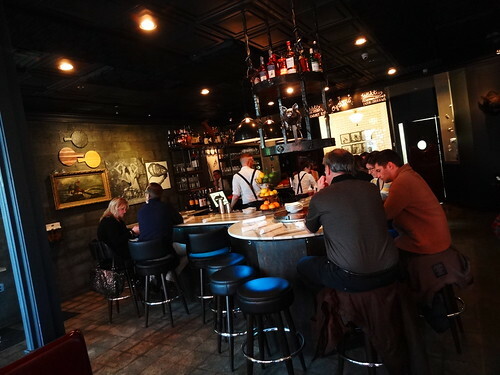 The compact space is cozy and charming, reminiscent of a speakeasy; the decor is a mix of wood, stone and vintage items. 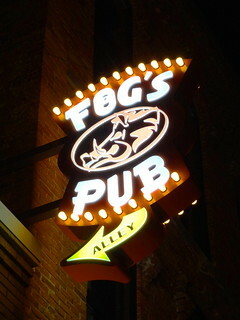 They offer a full food menu, classic craft cocktails, a giant beer list, wine and of course dessert. 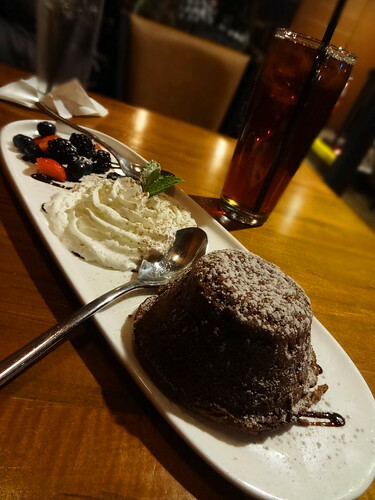 Craving a sweet ending to our evening we are sharing the Lava Cake. The warm chocolate cake is served on a rectangular platter alongside a mound of whipped cream and fresh berries, yum! It was a great idea to come out to Howell, we’ve had a wonderful time in the vibrant historic district. Come on out and see it for yourself!